Figure 2 (a) Three types of nori culture. 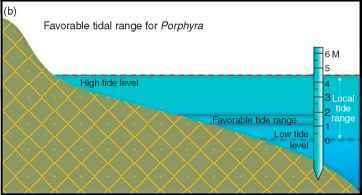 (b) Cultivation methodologies for Porphyra: Determination of tidal level for cultivation. (c) Semifloating raft culture of Porphyra. (a) Modified from Tseng CK (1981) Marine phycoculture in China. Proceedings of the International Seaweed Symposium 10: 123-152. (b, c) Courtesy of X. G. Fei. length, they are ready for out planting. 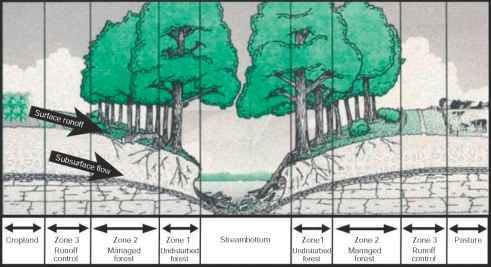 Seedlings may be separated from the bundles using one of three methods of cultivation: fixed pole, semifloating raft, or floating raft (Figures 2a and 3a). 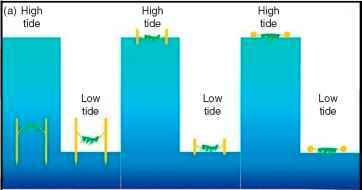 The fixed pole method is used in shallow intertidal areas (Figure 2b). The floating type is designed for deeper waters. 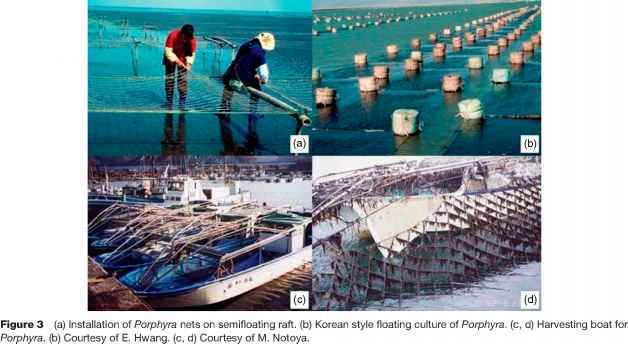 Specially designed harvesting boats lift the growing Porphyra nets (Figures 2a and 3b-3d). The semifloating raft is a hybrid ofthese two methods and is most suitable for areas that have extensive intertidal zones as at the mouth of the Yantzee River Estuary in China (Figure 2c and Figure 3a). be made from the same nets in one growing season as archeospores from the thalli reseed the nets during the growing season. Nets may be routinely harvested 6-8 times during the growing season (every 15-20 days), with yields of more than 3300 standard sheets (approxi mately 20 cm x 20 cm) per year.